The bitcoin has been a speculator in the past few days, thus making everyone happy with its price hike. Bitcoin is still proving its legacy as its price keeps on increasing. There are many factors to be considered for this price hike. The rising demand for BTC by the investors and several other factors pushed the bitcoin prices to reach over the historic price mark of 2000$. For the past few years when the price of bitcoin keeps on falling around $3000 at the end of last year, most of the cryptopreneur thought to the extent of saying that bitcoin will definitely get dead. So that the usage of bitcoin has become low. But at the beginning of 2019, the price of bitcoin has started increasing on gradually. This gradual increase reaches 3000$ then on 30th March 2019, BTC has raised above 4100$ mark. This upsurge of bitcoin range creates a hope that the price may cross 5000$ in less than 2 weeks. The surprising factor is that it happens within 3 days! The most recent bitcoin rally on 2nd April 2019, breached the BTC price through 16% in a single hour that is nearly 5000$ per coin. This was the second time for bitcoin price mark to cross 5000$ in a single day. 2. Litecoin reached 29% in a day with its CMP at $80.8, EOS spiked 20.8% with its CMP around $ 5.2. 3. Bitcoin Cash price range has jumped to 45% within a single day and is currently trading at $251.27! 5. Among the top 10, the least rising cryptocurrency was TRON, as it spikes only 8.41%. Currently, it is trading at $0.28. How this BTC price hike impact business people? Since this price hike transforms the world economy and created a huger impact among the entrepreneurs by creating awareness for them to get involved in cryptocurrency exchange/ trading business. Because of this increased globalization, the bitcoin trading/ exchange business will eventually bring a high level of profit. 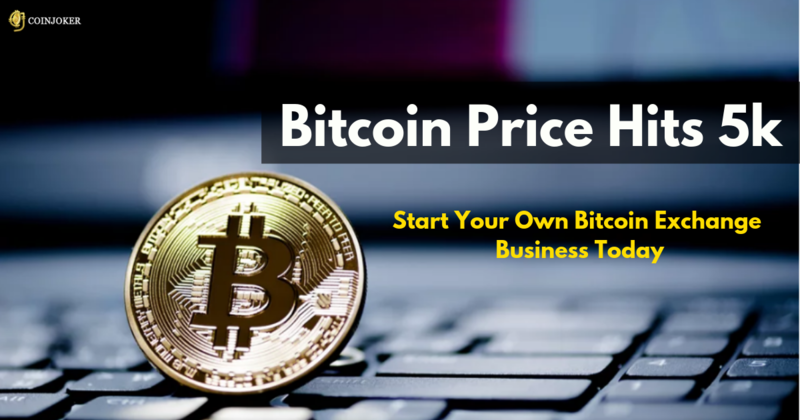 Interested to start your own bitcoin exchange business? We at coinjoker provides flawless Bitcoin Exchange software development services with additional business features as well as plugins to enhance your website. Get a free consultation to build your own reliable cryptocurrency exchange platform.